Arrow down to "COLUMNISTS" and click on my name. 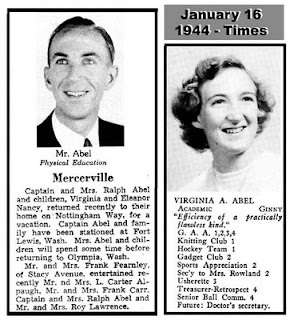 Ginny Abel was a classmate in Hamilton's class of '51 (the class with class). Her winning smile and pleasant personality endeared her to her classmates. Ralph Abel was in the "Phys Ed" department with Joe Bartlett, Kip Breece, and Don Devine, Carl Abbott, Herb Griffith, Lea Terry, and Bernie Hughes. Join us tomorrow (Sunday, March 22) from 1 to 3 PM as I bring the program, "Welcome Sweet Springtime" to those of us who remember the golden years. 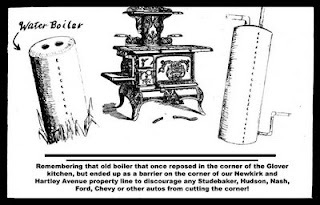 The program will be presented in the main dining room-theater of Kuser Farm Mansion on Newkirk and Leonard Avenue in Hamilton. 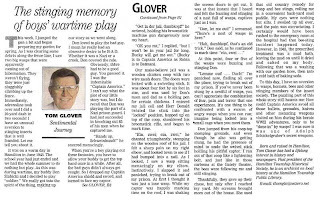 I will be recalling those wonderful years of our youth as we played sandlot baseball, the first girlfriend, the story of the old boiler, and of course, the main feature of our program, singing along to the songs we all loved. Come on out; based on past programs, I can assure you that you will spend a very happy two hours. 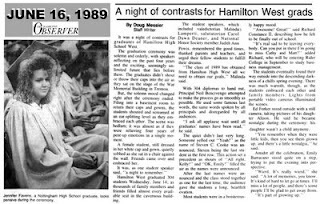 I have been writing newspaper columns for nearly 30 years, and in all those years, many of the hundreds of columns have dealt with pleasant and sometimes bittersweet memories of Kuser Grammar School and Hamilton High School. 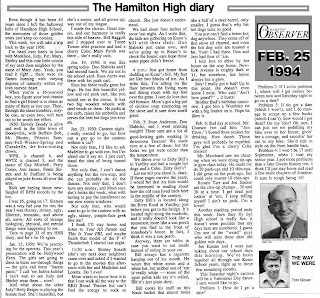 (before it became Hamilton West). The above column told of the trials and tribulations of a young man who was just approaching puberty, and the social and emotional toll it took on his emerging journey to adulthood. 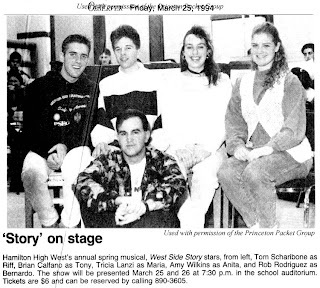 1994: HHS PRESENTS "WEST SIDE STORY"
1959: HAMILTON HIGH EIGHTH GRADE ??? This one has me completely baffled. Was it an error on the part of the Trenton Times? 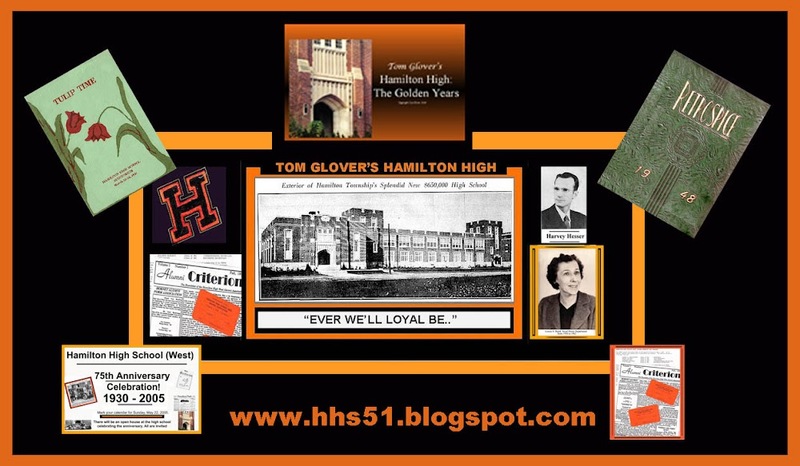 Was this really the class of 1959 at Hamilton High? Did the high school host a graduating class whose school was not available? 'tis a mystery. 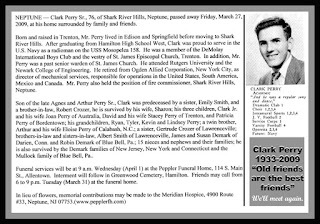 Perphaps a 1959 visitor can explain this article. These are 8th graders. 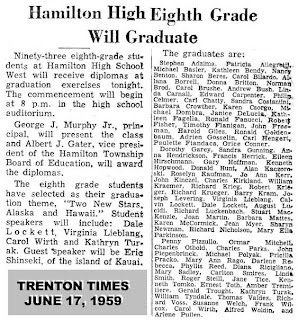 When half of Hamilton upperclassmen of that year (went) to Steinert, there would have been room at the old school for some 8th grades. You see Carol Wirth, daughter of Pauline and a friend of mine. She graduated from 12th grade at Hamilton High in 1963 so it works out.